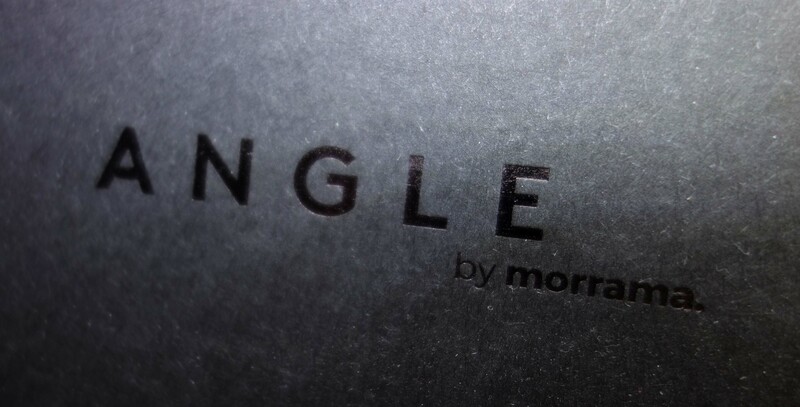 Overview: This is a review of the Angle Razor by Morrama. 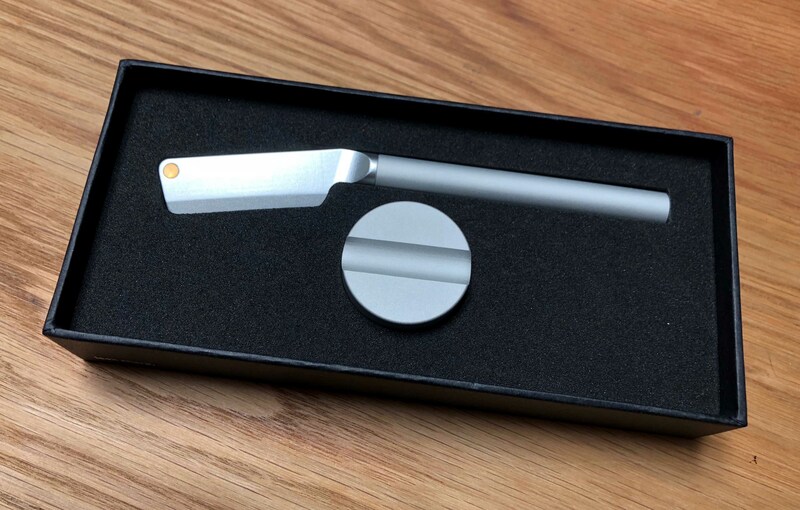 I received one of the first production run razors by backing it on Kickstarter. The Angle Razor It is made of aluminum and brass. I also ordered the matching stand and canvas travel pouch. Pros: Clever design, all metal construction, nice accessories. Cons: The execution has issues. 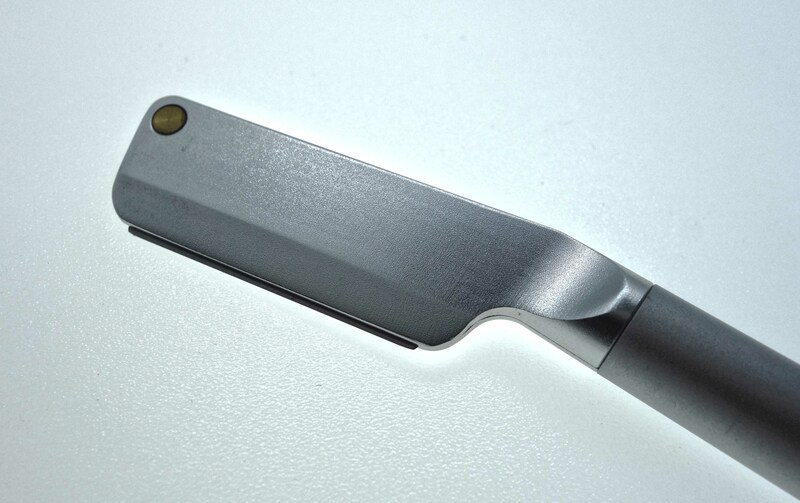 The angle of the blade in relation to the bevel is too steep, which makes shaving more difficult. 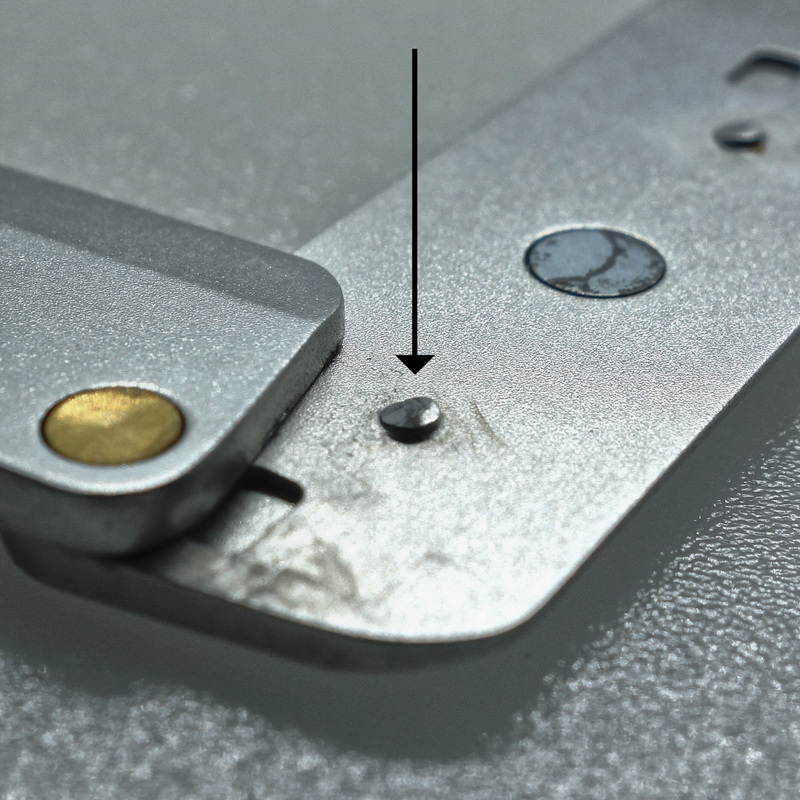 Some parts holding the blade in appear to be wearing quickly. 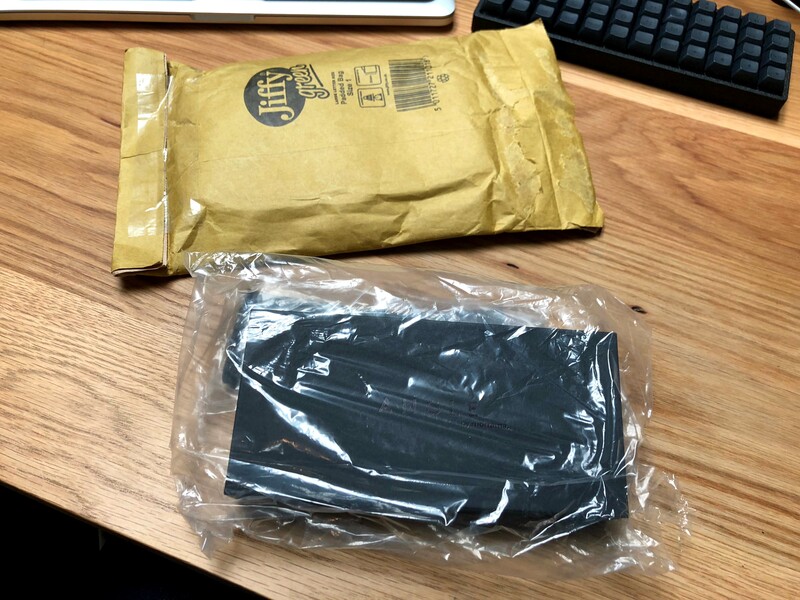 The Kickstarter arrived on time and was packaged adequately. The box was pleasingly simple, well made, and featured a reflective text. The presentation was good. The razor and base were nested in a foam cutout. I would have appreciated a notch to remove the razor, but it was not a struggle to remove. I also purchased the optional travel pouch. I was pleasantly surprised at the quality of this case. The inside was a microfiber/microsuede material that felt luxuriously soft. The faux leather band was decently functional, although I would have preferred a snap. Overall, I felt is was worth the additional cost. The Angle Razor is well balanced and very light weight. The aluminum construction makes it noticeably lighter than other steel razors, which may be good or bad depending on your personal preference. I personally enjoyed it, as I tend to move the razor in many small strokes as I shave. If your style is different, you may prefer a heavier razor. The stand is well made. It matches the razor perfectly and I was pleased with how the two looked together. 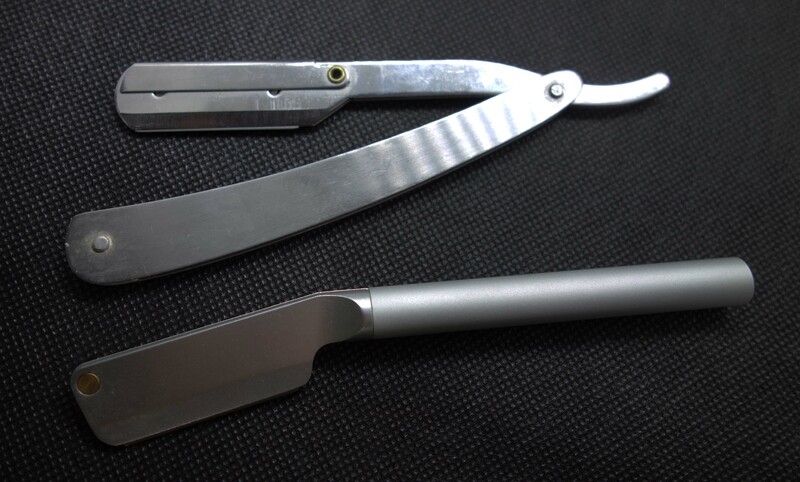 The razor uses single edge blades (or one half of a double edged blade). 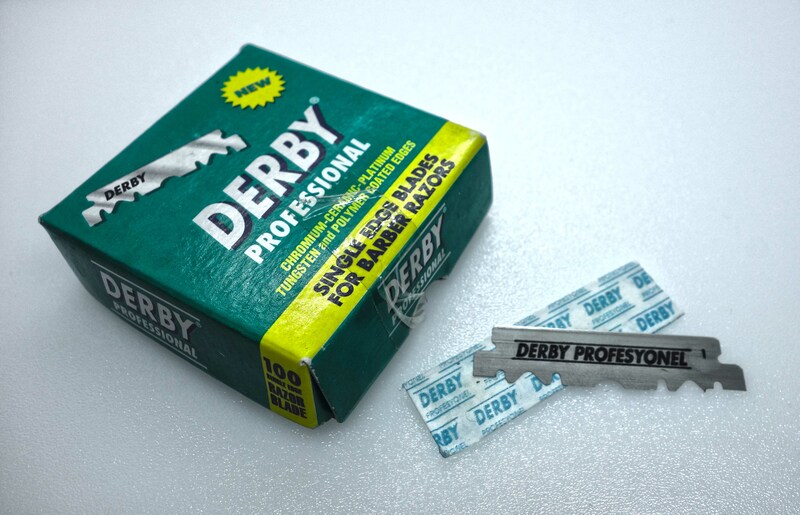 I used Derby Professional blades for my testing. 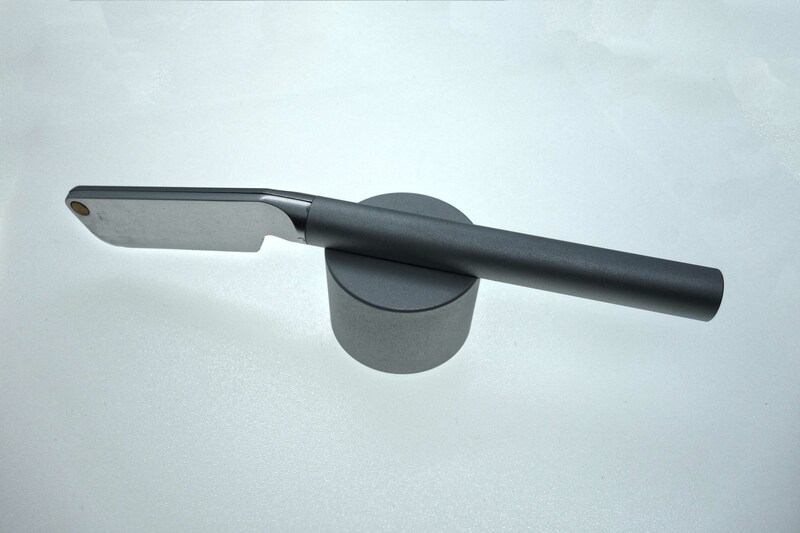 The razor is opened by unscrewing the handle and sliding open the top which is split into two halves. 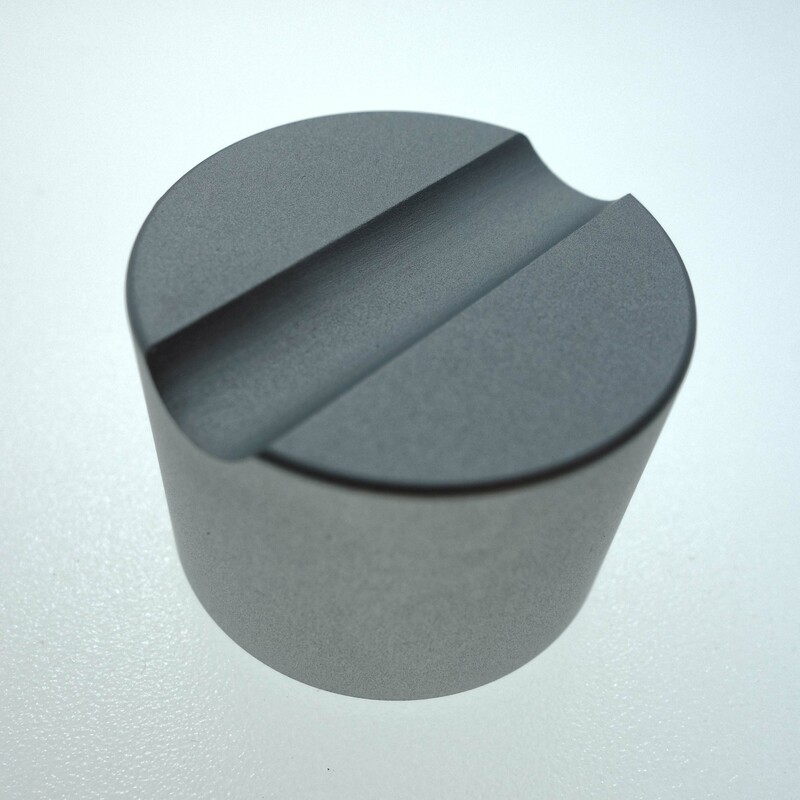 The blade is aligned on two pegs, and held in with the assistance of a single magnet. The magnet is useful, but not very strong; It does not keep the blade from pushing out slightly as the housing is closed over it. I found that some adjustment was often necessary to get the blade evenly positioned for shaving. The first real issue I noticed with my razor was wear one of the pegs (shown right) that keeps the razor blade in. As the top half swings shut, it rubs against this peg and within less than a week, wore it down significantly. I am not sure whether this peg was designed to wear in and form a ramp, or wether this is a tolerance issue. The Angle Razor does hold the blade safely and securely, but I am concerned that in a few years, the rubbing surfaces may cause issues. My previous razor was an inexpensive $10 stainless steel razor that I ordered from amazon. 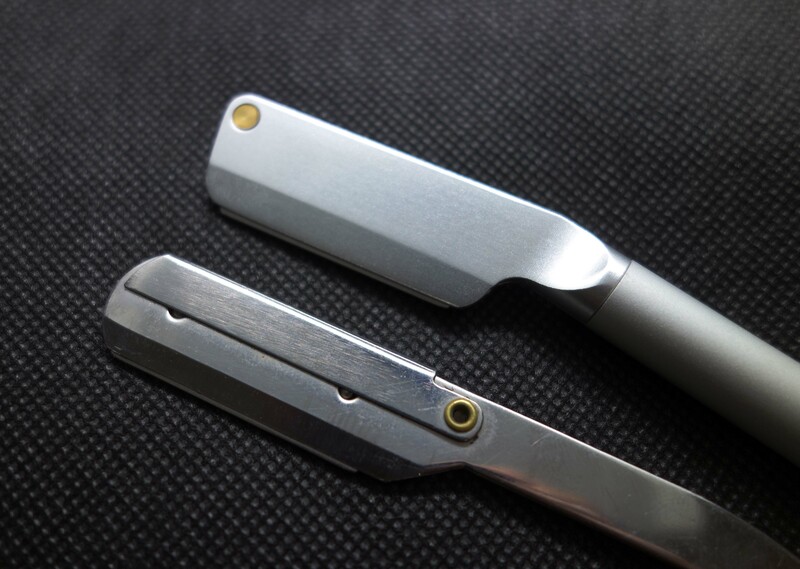 I have been pleased with the performance and design of this razor, with the exception that the stainless steel is of poor quality and has begun to rust. 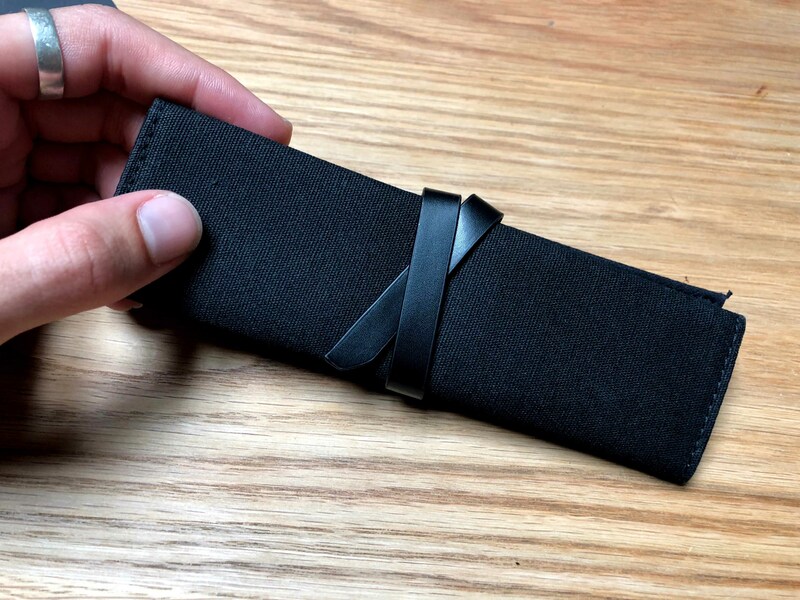 It is the same size (when folded) but is not nearly as comfortable ergonomically. 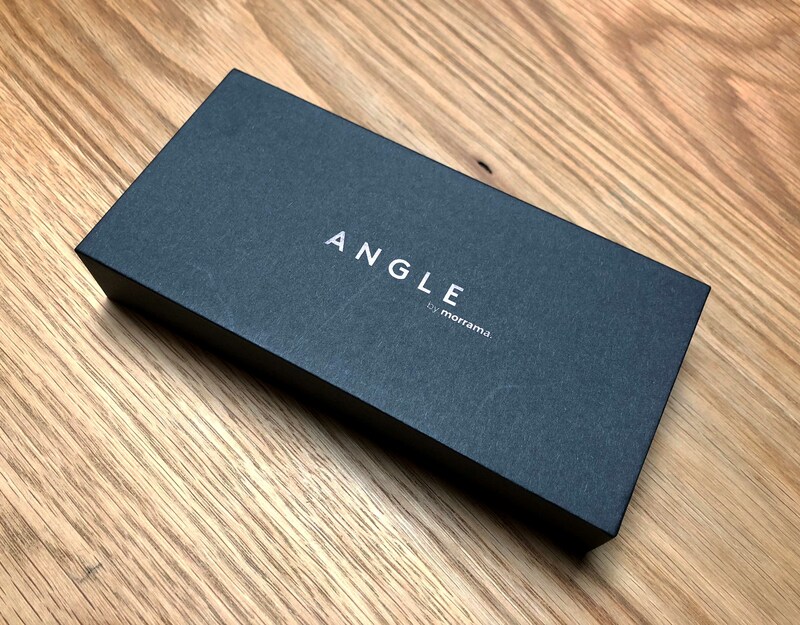 The Angle Razor offers a more comfortable hold and superior control while shaving. The two razors accept the same blade, but they are otherwise very different. 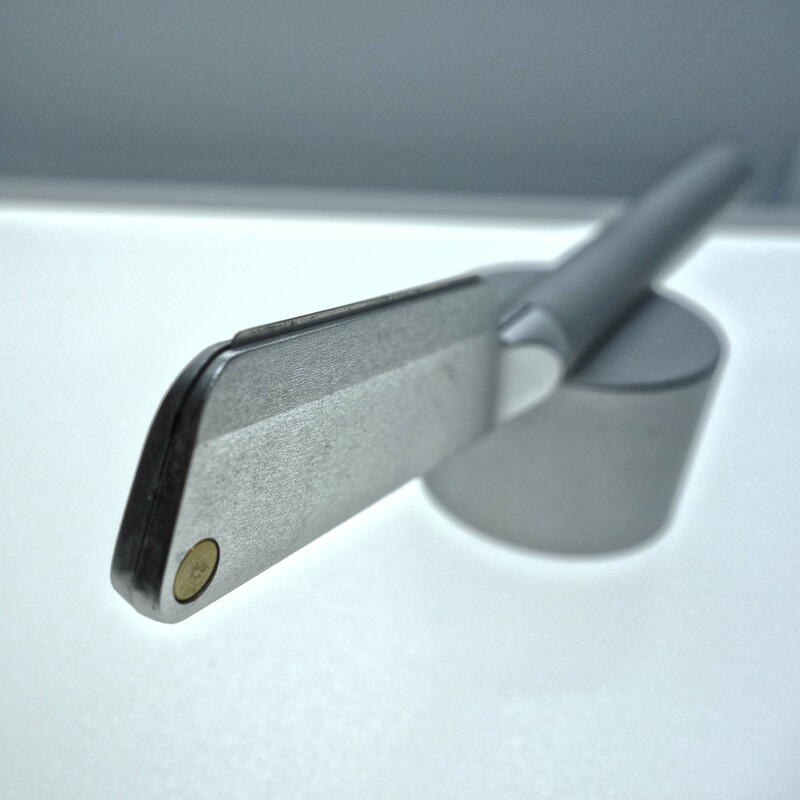 The angle razor squeezes shut by screwing the handle tight. This is much safer than the other razor which uses a clip on the top that requires a lot of pressure to push closed. It can be nerve wracking at times to pull the clip open when the razor is wet for fear of slipping and cutting oneself. The Angle Razor reuqires almost no effort to open and feels very safe. After many days of shaving, I noticed that I needed to hold the Angle Razor at a different angle to my skin than I was used to. At this point I took the time to examine the blade geometry more closely. I noticed that the blade did not extend as far out as my other razor, which meant that the cutting edge of the blade was not contacting my face as expected. 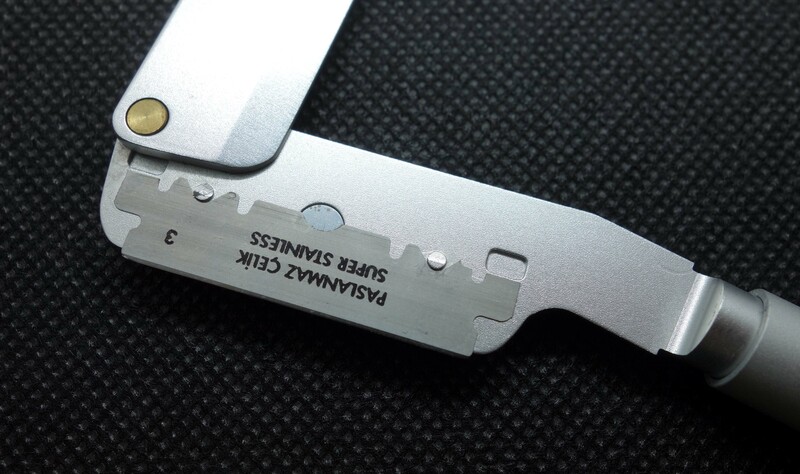 The white lines shows the flat bevels of the Angle Razor. The black lines point to the end of the blade. On my other razor, these lines are much closer together, which makes shaving at a shallower angle possible. With the Angle Razor, I found it necessary to hold the razor at an uncharacteristically steep angle. In sum, the idea and design of the Angle Razor are good, but the execution is not what I had hoped for. The razor works and looks pleasing, but for $110 I am left wondering if my $10 razor does a better job. I have decided to keep both for the time being, which is not ideal. 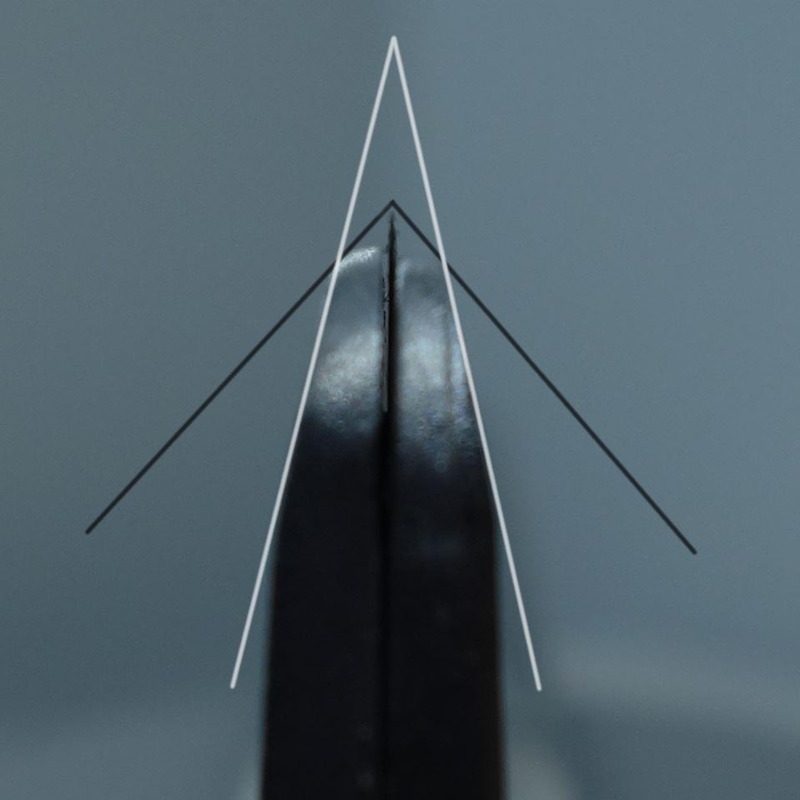 I hope that future iterations of the Angle Razor will address these issues by updating the fitment and geometry of the razor blade.